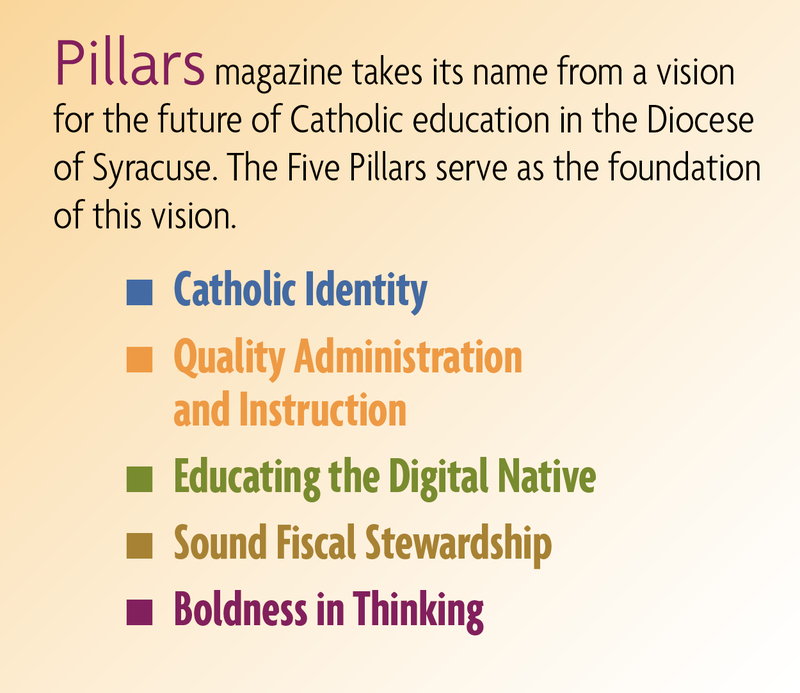 Seton Catholic Central School in Binghamton, NY, has supported this concept by fortifying its own Science, Technology, Engineering and Math (STEM) focus. It has done so by building and updating science labs and becoming the first Catholic high school in New York State involved in Project Lead the Way (PLTW), an innovative national pre-engineering program for middle and high school students. According to Principal Richard Bucci, the U.S. Department of Education and New York State consistently documents that there is a shortage of professionals in STEM areas. “The premise is that it could potentially put our national security at risk in the future,” he said. Science Department Chair Diana Simpson agrees, “STEM is so big right now. Everyone is talking about it from the high school up to the President of the United States.” Seton is in the final phases of strategic planning. Bucci said one of the goals of that plan was to become a model school in STEM. It not only provides students with necessary skills for the future but is helpful in marketing the school. 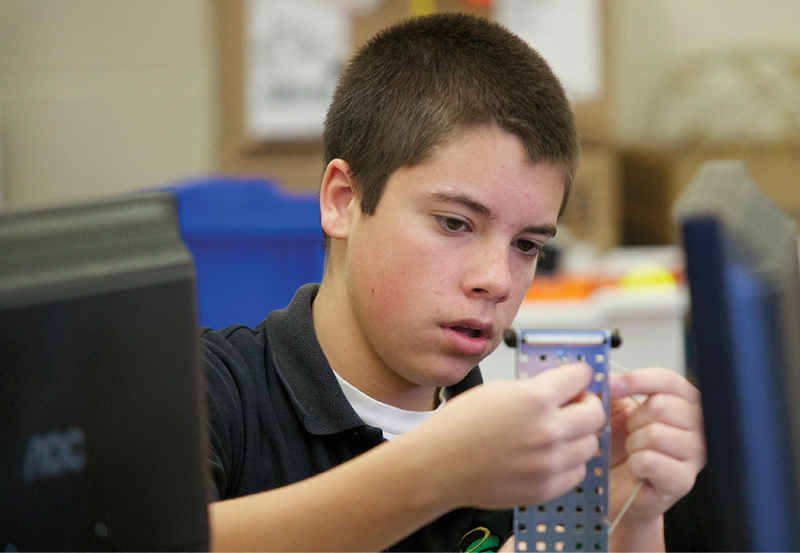 The school is one of only 4,000 across the country to offer PLTW. The program helps students develop skills they need to successfully navigate high tech fields. The course of study consists of a sequence of five pre-engineering courses taken over four years, beginning with Principles of Engineering. Simpson said this course provides groundwork and introduces students to the types of engineering careers possible. Lesson plans include field trips to engineering firms and guest speakers. She also asks her 14 students to provide oral presentations on the type of engineering that interests them, including potential income and required qualifications. “Students have a limited comprehension of the diversity of the field,” Bucci noted. Engineering can include a range of studies, such as robotics, simulation or aeronautics. He pointed out that the PLTW program helps student get a leg up on their college credits. If a student is accepted at Rochester Institute of Technology, a partner program, he or she could start a college career as a second semester freshman. Bellringers, a tool used by teachers to focus students at the start of the class, are a little different in pre-engineering. Simpson said her class watches and discusses a two-minute video of something being built, taken apart or even being blown up. Recent discussions have covered the conversion of Route 17 to Interstate 86, which involves blasting through a mountain. Setting the stage for STEM education, Seton’s students can also explore their studies in new and improved science labs. With a new 7th to 12th grade configuration, labs were built for the junior high classes, prompting renovation to the four existing senior high labs. “With the exception of some minor things, the high school labs hadn’t changed since I graduated in 1972,” Bucci said. Thanks to the support of donors to Seton’s capital campaign, renovations provide more flexibility and mesh better with current technology and teaching methods. “We asked ourselves, ‘How would this look on the college level?’” Simpson said. In some rooms, fixed tables called lab benches were replaced. New mobile benches have locking wheels and are hardwired with electricity accessed by dropping down cords to covered floor outlets. Front benches for teachers were removed altogether in the chemistry and biology labs to provide another 6 feet of lecture space. Cabinets were refinished to provide a facelift. Behind and above the scenes, new gas, water and electric lines, as well as new lighting, were installed. Funding also made it possible to outfit the rooms with equipment. Simpson said 12 new computers with probeware were ordered and iPads will now be available in the earth labs and chemistry. Thirty new biology microscopes and materials for eight new physics lab lessons were also purchased. Dyann Nashton is a freelance writer based in Oneida, NY.